This quest is available immediately after speaking to Allie and finishing up Mass Fusion, once you’re back in the Institute. You can then rush over to Father to receive the details of your new assignment. These will vary depending on what you’ve done up to this point, but the salient point is the necessity of recruiting a scientist who’s currently ducking the Institute. 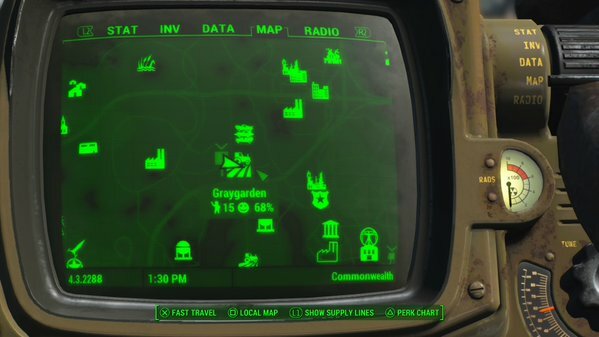 To find him you’ll have to travel to Graygarden, a robotic farm that may be a settlement under your control by now. Head west a short ways from Graygarden to find its small Homestead, where the scientist is penned up and awaiting extraction. Continue with your mission by telling the Minutemen to stand down. If you succeed they’ll let you enter the house; otherwise, you’ll have to kill them to stop an attack. Do not have the majority of your companions nearby if you have to take ‘em out, ‘cause they will detest you afterward. (The shot of Piper above is explanation enough, I think.) Enter the house and speak through the ‘inaccessible’ door by the entrance to convince the scientist to leave, ending the quest successfully and earning you the quest Powering Up. Ignore your mission and order the Minutemen to attack. They’ll enter through a rooftop door and fight their way downstairs. If you help them kill the Synths inside the house you’ll fail the quest, then immediately gain and complete Banished from the institute. Say goodbye to that Institute quest line. If you’ve never met the Minutemen, or haven’t done enough to help them out, you’ll find Gunners outside the house instead. You can probably guess what you need to do. The rest of the mission more or less proceeds in the same fashion from that point on.